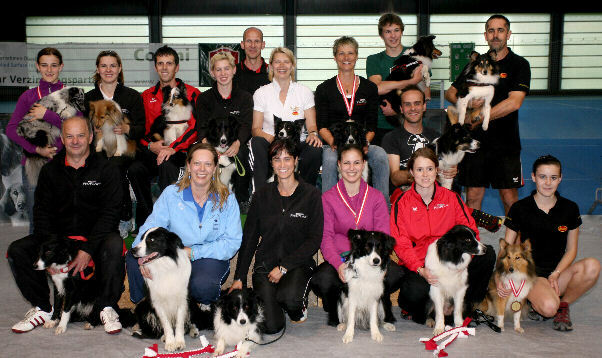 jumping team (de agility vision), smooth agility (en 3D). agility team (de agility vision), smooth agility en 3D. individual jumping (de agility vision). individual agility (de agility vision). team agility (de agility vision). 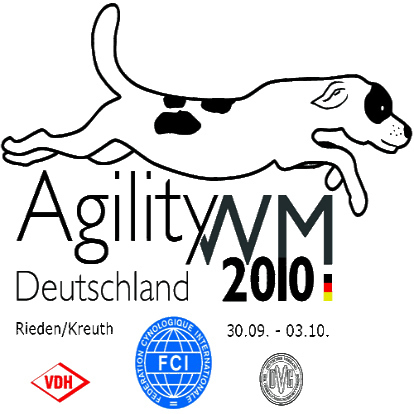 agility team (de agility vision). team jumping: large, medium, small (.pdf). individual jumping large, medium, small (.pdf). team agility: large, medium, small (.pdf). individual agility: large, medium, small (.pdf). en Rieden, Germany (webpage y twitter). Local: es ostbayernhalle (Eastern Bavaria Hall) 1, 2: el espacio es 40 X 80 y el piso es una mezcla de arena, arcilla y aserrín. participantes confirmados (click), lista oficial (click). large team: jumping, agility+ jumping. large individual: jumping, agility + jumping . medium team: jumping, agility+ jumping. medium individual: jumping, agility + jumping . small team: jumping, agility + jumping . small individual: jumping, agility + jumping . Nalle Jansson (Suecia), Sabine Mac Nelly (Alemania). Nalle Jansson (Suecia): webpage, pistas del 2009-10: 2009-10, más pistas. Sabine Mac Nelly (Alemania): varias pistas. el proveedor de los obstáculos es Premier de UK (referencia, Premier: usar IE). las inscripciones vencen el 15 de agosto del 2010 (click). porcentaje de razas en cada categoría (click) scheduling detallando con horarios de la competencia (click). órdenes de largada individual por nro. de salida en .pdf: large, midi, small. los horarios de prueba de obstáculos del jueves publicados por gente de Estonia (click). Lista oficial de inscriptos (click). información de estonia (click, traducción de google al inglés). referencia: 1, 2. LARGE: Silas Boogk & Back in my heart of Kevins Land (BC), Máller-Schnick Philipp & Finn from up the Road (BC), Elsner Claudia & Ace Joe vom Rosenstamm (BC), Nieder susanne & Hazel from Thircans Dream (BC). MEDIUM: daniel schröder & excellent choice (PS), Robin Pfau & harriet (welsh terrier), stephanie tiemann & chili (manchesteer terrier), nicola dorny & Huckleberry (welsh terrier). SMALL: Hinky Nickels & Knight (PS), Renate Käsgen & Queeny (PS), Paul himing & Jas (PS), Ilona rinke & beauty (papillon). referencia LARGE: (indiv) Lisa Frick (WM 2009) & Hoss v. First Hemp of Devil Brooks, Foglar Andrea & Twister of Jennifer's Bonfire, Novak Susanne & Mawlch Minn (BC), Brandstetter Michaela & Ginga of Magic Border's, Paulik Helmut & Beautiful Lane of Annie's Paradise, Fried Hans & Nirvana of Jennifer's Bonfire, Plenk Anna & A Little Momo. Equipos: Anna Plenk & Illeen of Magic Border's, Sonja Mladek & Rory of Jennifer's Bonfire, Sybille Flek & Earl of Pinewood Country. MEDIUM: Meyer Walter & Amiga von Don el Ranzo (PS), Purtscher Lukas & Mandy (Orora vom Rindsberg), Meyer Katharina & Bigg (Jasmine Gold of Working County). equipos: Daniela Traber-Matzi & Ginger Black of Summergarden, Amiga y Jasmine. SMALL: Hauser Sabrina & Amber-Astra in Gold Austrian Spirit, Brandstetter Lisa & Lynn (Celebrita z Dablovy Studanky), Aigner Lukas & Alexis. referencia: click. LARGE: Susan Garrett & Encore (BC, Ontario), Susan Garrett & Feature (BC, Ontario), Fred Waters & Tanafon (BC, Quebec), Adrian Rooyakkers & Fizz (BC, Ontario), Theresa Rector & Phoenix (Kelpie, Ontario, reserva). MEDIUM: Nicki Gurr & Ninja (PS, British Columbia), Justine Davenport & Preston (PS, Alberta), Teri O�Neil & Cypher (PS, Alberta), Lucie Dessurault & Nitro (PS, Quebec), Justine Davenport & Riot (PS, Alberta, reserva). SMALL: Jessica Martin & Dice (PS, Ontario), Lynda Orton Hill & Favor (PS, Ontario), Cathy Taylor & Brigs (PS, Ontario), Suzanne Labrie & Copine (PS, Quebec). referencia LARGE: Sarah Lorentzen & Simic (BC), L. Moller & Froken, Lone Sommer & Panik (BC), Peter Crone & Tempo (BC) (reserv: R. Reinhard & Nike). MEDIUM: Gitte Hoffmeister & Zinnia, Jesper Carstensen & Indi, Marianne Blom Larsen & Zippo, Ann-britt Homlegaard Krat & Diesel (reserv: Jannie Nielsen & Cody). SMALL: Susanne Prier & Unique (PS), Lillian Rose & Mille (Poodle), Jesper Kjaer & Emsi, Hanne Svejstrup & Soffy (reserv:Julie Holten Moller & Chilli). referencias: 1, 2. LARGE: Oscar Muñiz & Boss (BC), Antonio Molina & Angie (BC), jonathan guillén y chus (BC). Nuria & Furia (BC) en indiv. MEDIUM: estel boix y tona . referencia. LARGE: Natalja Garastsenko & Rej (Beauceron), reserv: Marilin Kooskora & Rica (tervueren), Sirje Tammsalu & Rurik (Poodle), reserva: Helena Trus & Baki (Hungarian Vizsla) . MEDIUM: Liivika Parg & Piko (pooodle/caniche), Natalja Gara�t�enko & Tika (german hunting terrier), Inga J�rv & Tuutu (english cocker spaniel), reserva: Katrin Viigand & Delfy (english cocker spaniel). SMALL: Elika Salonen & Charlie (cavalier), Kristi Vaidla & Lexi (jack russel), Ede Brand & Snappi (pinscher), reserva: Tiina Jurjo & Lill (welsh terrier), . referencia. LARGE individual: Christelle BOUILLOT & ANGGUN (BC), Thierry KWASNY & ASTUCE (BC), Stephan ROUSSEL & BAIA (BC), Grégory BIELLE-BIDALOT & CAYENNE (BC); team: Alain REMUND & ASPEN (Malinois), Jeremy CHOMIENNE & ADSL (BC), Patrice WUILLAUME & Voice (BC). MEDIUM individual: Emmanuel MELAIN & Aqua (kelpie), Renaud CASTELAIN & Demeter (PS), Johann CANAL & Bad Boy (PS); team: Emmanuel MELAIN & Aqua (kelpie), Pauline JENN & A little star (PS), Thomas RACZKA & Curly (berger des Pyr). referencia: click. LARGE: Katja Slippens & Franny (malinois), ton v.d. laar & armatis elles (BC), patrick tunders & armatis mekx (BC), martin servaas & kate (BC). MEDIUM: Henk Postma & AC/DC (papillon), connie katoen & bibi (Schapendoes), Werner Rosseau & blizzard (PS), Sharon Broeders & ubey (PS, reserva). SMALL: Roger v.d. Laarschot & troy (PS), Henk Postma & dolly (poodle), Aneska Damen & gipsy (papillon), Marc Valk & yade (PS, reserva). SMALL: team+ individual: Nicola Garrett & Indiana (PS), Dawn Weaver & Puzzle (Papillon), Dawn Weaver & Chelsea (caniche /poodle). referencias: .pdf. LARGE: Cerna Michaela & Jack, Bertuletti Ezio & Affinity Del Mulino Prudenza ( Penelope Cruz), Cacciatori Andrea & Viba`s Lilith, Catia Mariottini & Zuni, Occhini Andrea & Gio del Mulino Prudenza (BC), Ciaghi Paolo & Fatal Beauty Del Mulino Prudenza (Moon), Stranj Masha & Cloe, Ermanno D`avino & Yuo`ll Never Run Alone (Nap), Carretti Cesare & Lady-d (reserva). SMALL: Verri Naima & Bluenight Detta Nina, Raimondi Luca & Nice Blocker Detta Ori, Eccher Mirko & Halle. Ivana Sipalova & Nyo (jack Russell) (reserva). webpage, referencia. 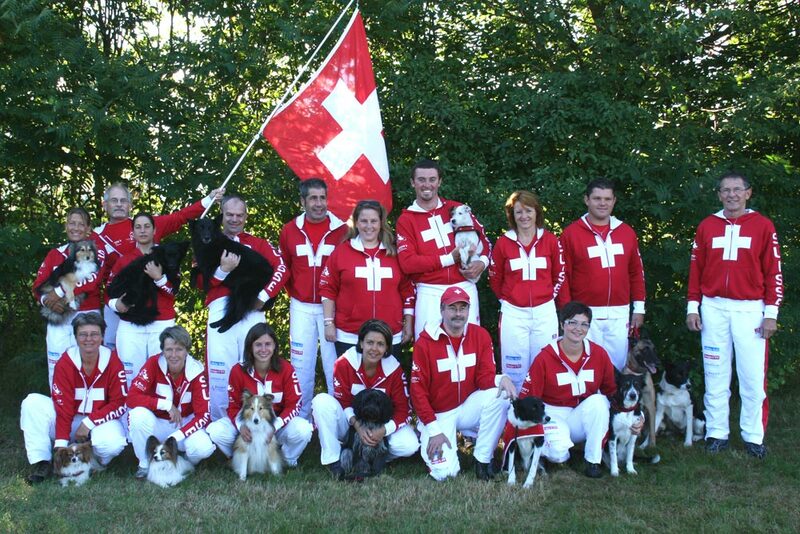 LARGE: Rosy Raymond & Jane (BC), Nehrbass Gaby & Kimba (BC), Betz Nathalie & Jewel , Speicher Serge & Jody (reserva). MEDIUM: Thines Fabienne & Baby (PS), Hoffmann Raymond & Velvet, Betz Nathalie & Nelson (PS), Schiltz Rolli & Page (reserva). SMALL: Oé Mireille & Fee (PS), Thines Fabienne & Fly (PS), Thines Fabienne & Vloh (PS), Speicher Serge & Folie . MEDIUM: (individuales) Pavol Vakonic & Vivien (foxterrier), A. Habajova & Any, Z. Vetrakova & Clea. (team)E. Gasparova & Putin (foxterrier), A. Habajova & Any, Z. Vetrakova & Clea. SMALL: (inidv) Pavol Vakonic & Cira (papillon), A. Kruzinska & Aminka (team) Pavol Vakonic & Cira (papillon), A. Kruzinska & Aminka, Miriama Antalová & J.C..
webpage. LARGE: Anita Folly & Bliss(BC), Pascal Mauroux & Bejay (Groenlander), Martin Eberle & Magic (BC) , Marcel Magnin & JJ (BC), Martin Eberle & Even (Malinois), Remo Máller & BritBrit (BC). MEDIUM: Letizia Pellegrini & Nomade (Mudi), Melanie Stettler & Januja (schap. ), Claudia Tschuor & Cuba-Libre (Berg des pyr), Simone de Brot & Jamie (PS). SMALL: Nicola Giraudi & Twister (Parson), Nadine Hunsperger & Q (PS), Barbara Feer & Speedy (Papillon), Vera Fuchs & Anjing (papillon). referencias: 1, 2, 3 LARGE: Terry Smorch & preston (BC), Channan Fosty & Icon (BC), Ann Braue & Scream (BC), Daisy Peel & Solar (BC), Silvina bruera & Maja (BC). MEDIUM: Karen Holik & Sizzi (PS), dianne Goodspeed & Kelsi (PS), Maureen waldron & Mickle (PS), John nys & Rush (PS), Nancy Kleinhans & Jimmy Dean (PS). 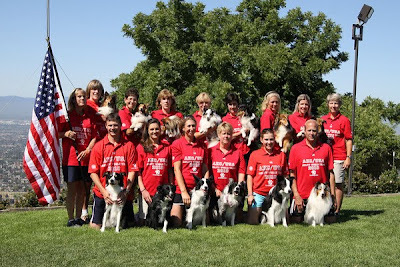 SMALL: Marcy Mantell & Wave (PS), Dee Anna Gamel & Kelsi (PS), Anne stocum & Breeze (PS), Heidi Vania & Ice (PS), John Nys & Blink (PS).